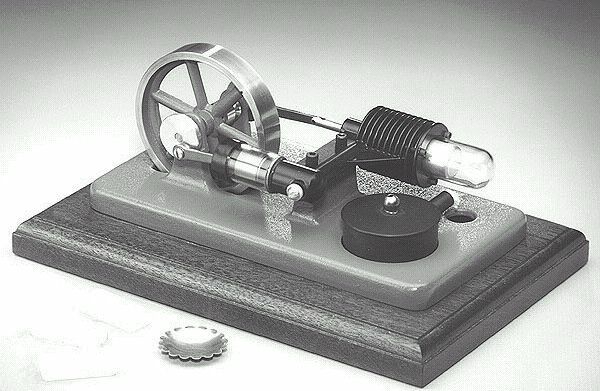 This miniature Stirling Cycle Engine measures 7" x 4-1/4" and comes complete with built-in alcohol burner. Red flywheels and chassis mounted on a green base, these all-metal beauties silently running at speeds in excess of 1,000 RPM attract attention and create awe wherever displayed. This model comes completely assembled and ready to run. The Sun Runner, a solar-powered Stirling Cycle Engine, offers a dramatic demonstration of energy conversion. 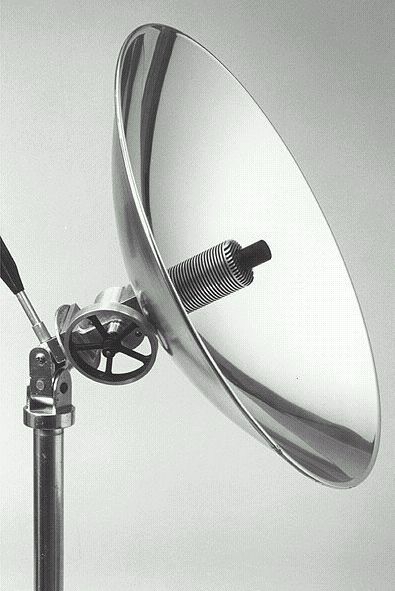 This motor, with its parabolic mirror, can be attached to any conventional camera tripod. When properly aimed at the sun, incoming solar energy is focused on the heat cap of the engine and is converted to rotary motion. Each unit is test run at our factory. 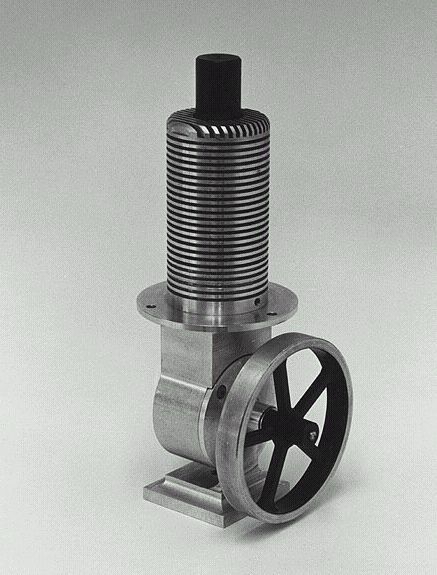 Specifications: 2,000 RPM and up, 8-1/4" long x 3" wide, 3/4" inch bore, 3-1/4" flywheel, Aluminum precision castings. Parabolic Mirror is 18" diameter polished aluminum. Unit comes complete with motor, parabolic mirror, and wrenches. (Standard camera tripod not supplied.) Completely assembled and ready to run. See the pistons at work. Look inside the glass cylinders at the Stirling Cycle principle in action. This engine is extremely interesting to watch, is well built, and runs at speeds up to 1500 RPM. This is a hard combination to beat. Gyro-quality ball bearings, machined flywheel, sand cast frame which is painted royal blue, aluminum cooling fins and a hardwood platform are only a few of the outstanding features incorporated into this engine. 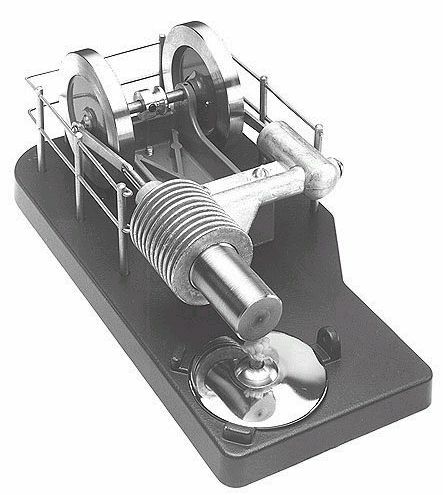 To illustrate the versatility of a Stirling Engine, we provide a burner for denatured alcohol and a platform for solid fuel. A sample quantity of ESBIT dry fuel is supplied with the engine as well. Special features include: replaceable and adjustable Pyrex hot cap, replaceable Pyrex power cylinder, dual fuel capability, and a solid hardwood platform. Specifications: 9" length x 4" height x 6" width. Completely assembled and ready to run. The first "RIDER" engines were manufactured in 1880 by the De Lamater Iron Works. This engine was the inspiration for our "Peanut RIDER." 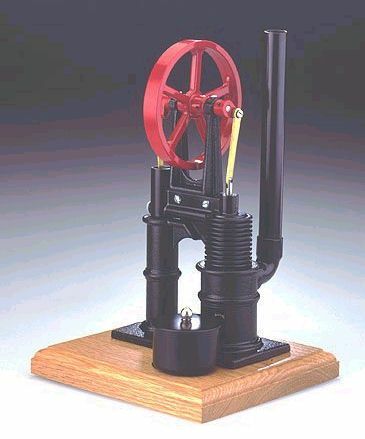 This all metal, black and brass engine with red flywheel is mounted on a solid hardwood platform. It is an excellent running engine and will make a handsome addition to your collection. Each engine is test run at the factory and comes complete with an alcohol fuel cell, extra wick, allen wrenches, and Owner's Manual. 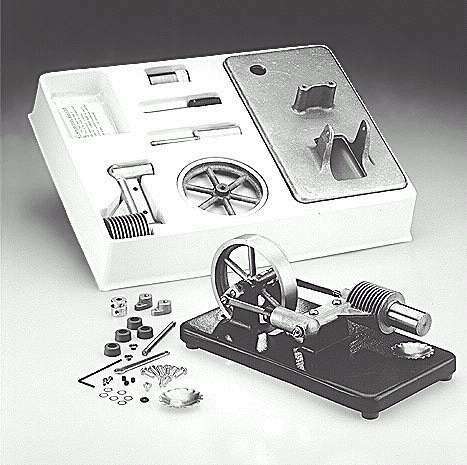 An ideal project for the beginning model builder. Easy to assemble and runs very well. All machining has been done for you. A dry fuel platform and a test quantity of "ESBIT" dry fuel is supplied. Denatured alcohol also works well as a fuel for Stirling Cycle Engines. Specifications: 7-1/2" length x 3-1/2" height x 4" width, up to 1000 RPM, die cast aluminum cylinders, brass arms, and a sand cast aluminum platform and flywheel.